First and most importantly on todays agenda was to meet my Queen, Minnie Mouse in her gorgeous Spring outfit and as always she did not disappoint and was absolutely adorable, I always have such lovely meets with her, probably due to her being my absolute favourite and that being quite evident from being decked out in all the Minnie attire, I'm talking ears, shoes, jumper, jewellery, the lot! When she asked for a kiss, I couldn't say no to her could I? Photos, hugs, kisses & goodbyes done, I enjoyed just admiring the park in the sunshine, well Main Street anyway which I took a slow stroll up before heading towards the castle and spotting the cheeky Chip & Dale were out, never one to miss out on meeting those 2 as it's always so much fun, I joined the queue. 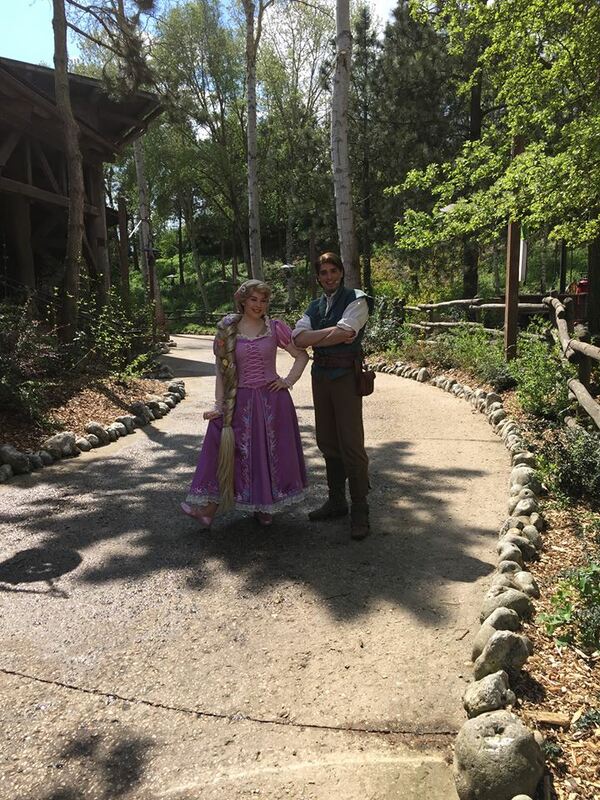 As always a brilliant time with those two mischievous chipmunks and I took a slow stroll over to Frontierland where I bumped into Laura & Milly and before long then bumped into the rest of the group that were all there. After a chat, some fun and a little decision making we split up again as we all had different plans as to who we really wanted to meet and Milly & I were desperate to meet Rapunzel so we headed on over to The Princess Pavilion, where despite a long wait we decide to just go ahead to do it in hope we'd get to the end and Rapunzel would be waiting, things didn't exactly work out perfectly but thanks to two wonderful cast members we got to meet the Princess we hoped for, although I also would have been chuffed to see Belle, but I'd never met Rapunzel before and she is very close to be my favourite when it comes to The Princess so I really had my hopes up to see her. By now it was almost time for the first Forest of Enchantment show, and we couldn't miss that could we? well we did, yep we got there just as it started and they wouldn't let us in, boo! We ended up having a sit down in the sun and waiting for the show to be over and the others to come out, we did hit a bit of luck though because while waiting to go back in the theatre for their last part we spotted Rapunzel & Flynn who walked over to say hi and pose for a photo which was just lovely and made up for not being able to get in to the show, never mind because we still got to see it twice later on in the day. Milly, Lottie & I decided to head over to the Studios park, well not before meeting Peter Pan & Smee on the way, we wanted to see if any characters were out and to of course do our favourite ride, Tower of Terror which ended up being so much fun, not only was the ride great but the cast member had us giggling constantly, well before we went up and in-between the drops anyway. We were soon heading back into Parc Disneyland for Forest of Enchantment and Magic on Parade, which both were again, brilliant, once again we had some great interactions from the characters during the parade. Unfortunately it was getting closer to the time I was having to leave, but the girls talked me into watching the Welcome to Spring show with them, which I have to say I wasn't that keen on, this could be to do with the fact I'm not a Mary Poppins fan at all though but it was nice to spend my last few moments in the park with a lovely bunch who had made the trip even more perfect and before I knew it I had to say my goodbyes and make my way back home. 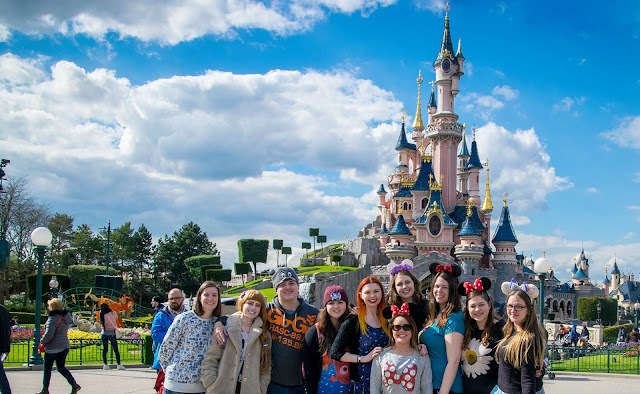 It was an absolute fantastic trip, made even more special by getting to spend time in the parks with some truly wonderful people, sharing time at Disney with people who truly do love and get it like yourself makes it even more wonderful and I'm so glad I had this trip. Swing into Spring season is really pretty with some lovely touches and I can't wait to experience it again in the future.